They say you’re either a cat person or a dog person, but why limit yourself when you can have both! Cats are aloof and sassy but also cute, and their affection is so precious, whereas dogs are goofy and hyperactive and lovable. Both are pretty territorial and like to be the center of their owners’ worlds, so how can you force Purrsula and Dogfred to become best friends (or at the very least not to kill each other!). Some cats and dogs are just not going to get on, so before you make any big commitments, make sure you have a backup plan. Perhaps someone else that will take one of them in, or even better, a way to keep them separated long term. Do your research before you try to force them together, otherwise, you could end up with two very unhappy animals, and no one wants that! So there isn’t really any hard and fast rules when it comes to specific breeds of cats or dogs getting on with each other better than others. It is much more important to look at their personality. For example, if a dog is aggressive and territorial, a timid cat would not be a good fit. Equally an aging dog may not appreciate sharing his sacred space with a crazy kitten. If you are adopting, make sure you ask whether the animals have ever lived with other animals before and what they are like with them, this should help you make a decision. Dogs are much easier to train than cats (perhaps because cats are stubborn!) so make sure your dog has been taught to control impulses. It is important that your dog has nailed this before meeting the cat for the first time as this could be a real issue. 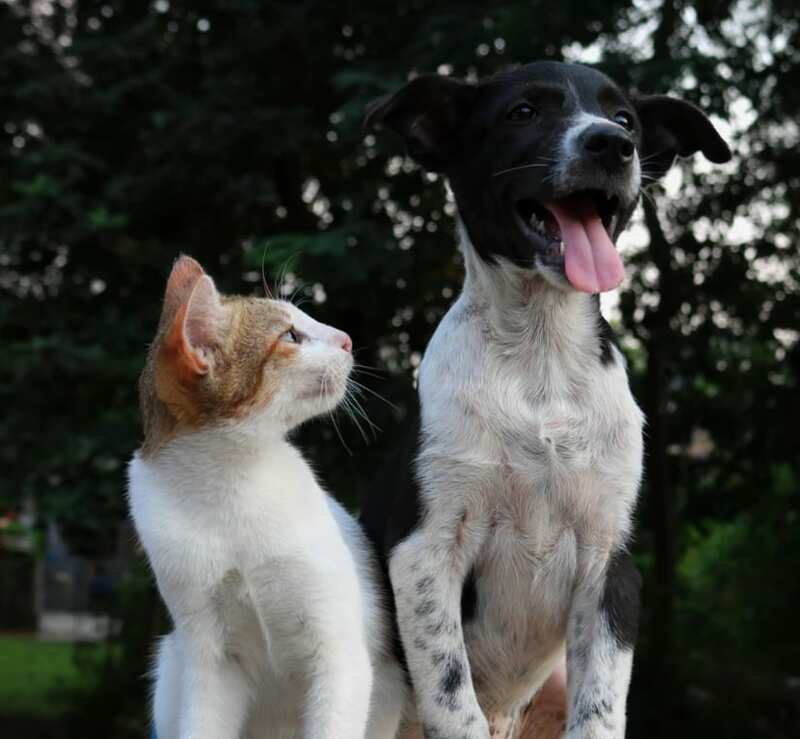 The first time you introduce your dog to the cat, keep a leash handy, just in case he forgets his training. Cats cherish their personal space, and they need somewhere in the home that is safe and off-limits to their canine sibling. Cats love to climb, so perhaps somewhere high such as a little bed on top of a bookcase. The cat will feel safe and can observe the dogs actions from their spot. It’s also important to keep the litter box a dog free zone for several reasons – firstly, no one wants to be caught doing their business, but also because dogs tend to snack on cat poop which could cause them a lot of health issues. Dogs have so much energy, and it’s important that this is released so that it is not used on your poor cat. Take them for walks, keep them stimulated by mixing in commands and changing speed and direction regularly. 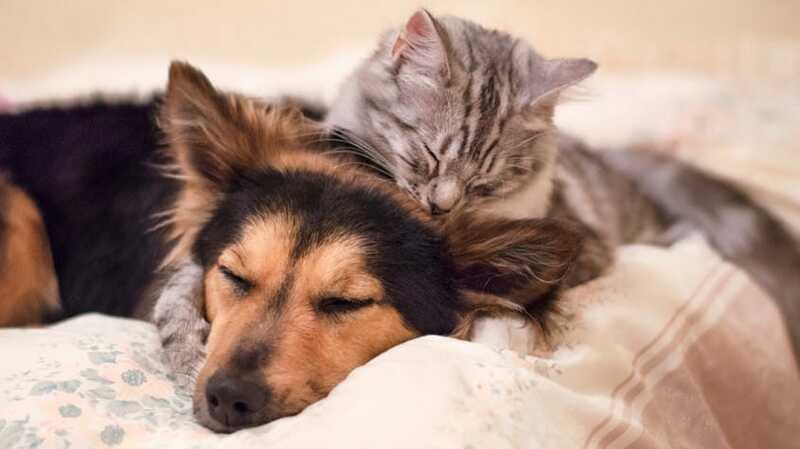 The more your dog releases his energy, the less likely he is to need to play with the reluctant cat! You can’t just throw them both into a room together; you have to plan this carefully. Do it at a mealtime, and have both animals on the opposite side of a closed door. They will be able to detect each other’s scents but at the same time, will be excited about food and if you do this a few times they will associate the smell with good feelings. Slowly remove the door and replace it with a screen until you finally have them together, although keep the dog on its leash until you are certain it is safe. As long as you think carefully and plan your actions, you don’t have to choose between a dog and a cat, and who knows, they might even become good friends and you’ll have a viral photo on your hands!